Unbeatable car hire at Malaga airport with Sixt, Avis, Hertz and all top rental companies. From €12 a day ! 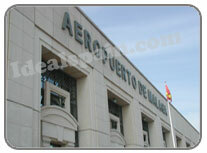 Malaga Airport is located about 8km south-west of Malaga centre and serves the Costa del Sol. It is accessed by the N340 motorway and the new toll-road. Work is still ongoing on the new terminal and car parks, although terminal 3 is now open. This means that access to Malaga airport is somewhat messy at present. Malaga airport is a modern airport with good facilities including 24hr cash machines, bars, restaurants and a shopping centre. In 2005, the airport was capable of handling over 12 million passengers a year and over 120,000 aircraft. Nowadays the figure is much higher (nearer 17 million). This is called Pablo Ruiz Picasso and was designed by Ricardo Bofill. Construction began in 1988 and was completed in 1991. The building has two floors with separate entrances from the street. The lower floor is devoted to arrivals and the upper floor to departures. An additional upper floor houses a shopping area. The terminal contains 65 check-in desks, 24 boarding gates, 14 walkways and 8 baggage pick-up belts. 180 check-in counters, 48 boarding gates and 26 baggage belts are just a few of the benefits of the new terminal. Pictured left is the approach to the airport in 2010 with the roadworks still in place. The picture shows part of the new airport terminal. If you enter the building at this point, a very long moving walkway will take you to the new departures terminal. Allow 10-15 minutes to get to the check-in desks. The new departures terminal at Malaga is pictured right. Thousands of square metres of glass was used. 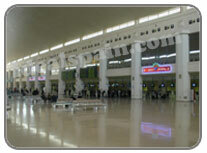 It houses 180 check in counters and 48 boarding gates. It can handle 30 million passengers per year. Terminal 3 at Malaga Airport also houses new facilities such as cafes and shops as well as a Burger King (located before going through to departure lounges). There is an Aena information desk in the centre where you can collect airport information and local tourist information. The terminal is non-smoking although there are ample ashtrays and seating areas outside the building. There are drop-off points outside the terminal buildings but they are security patrolled so don't park and leave your vehicle. After a few minutes it will be towed away. The tow truck sits on the lower level, waiting to pounce on you. Access to car parks is currently confusing due to the ongoing works. There have been numerous complaints already about the new layout at Malaga airport... people say it's not very user friendly. One particular improvement that we noticed at Malaga airport is the arrivals in terminal 3. The layout seems to be much improved on the old terminal. Public access is restricted now meaning that there are fewer people in your way when you arrive. As you leave the building by the main door, there's a new restaurant where you can grab your first drink and/or meal. You can sit inside or out on the concourse. Update 30/8/10 - the old arrivals area on the ground floor, where the Golf Bar was, is now boarded up and undergoing improvements. The new transport hub at Malaga airport will give easy links to buses, trains and taxis. There is a huge taxi rank on the lower level. Take a taxi from the front of the queue. The picture left shows the taxi waiting area in 2010. The train station is about 5 minutes walk from the airport. This station gives access to trains in the dirction of Malaga and Fuengirola. Purchase your ticket at the machine on the platform, before boarding the train. This became operational in 1996 and is located north of the main airport. It has four cold storage rooms, an area for hazardous materials, facilities for live animals and vaults for valuables. The unit has 16 docking bays for unloading vehicles. There is no left luggage facility at Malaga airport but there are lost luggage offices. Cafeteria facilities are better in the departure area where you will find Burger King and a Spanish bar. In the arrivals there is just a small Spanish style cafe. Outside is a bar/restaurant and info desk. You will find currency exchange offices, ATM and a post box. There are lifts from the arrivals lounge on the lower floor to the departure lounge on the top floor. The new transport hub at Malaga airport means that you no longer have to cross the main road to get to the station. The RENFE train runs in both directions. Malaga central in one direction and Fuengirola in the other. Purchase your train tickets when you get to the station. The machine is available in several languages. Use your ticket to gain access to the platform. The trains are new and easy to use. The next station is announced in English and appears on a screen in each carriage. There is ample room for luggage. All trains are no smoking. You can find a taxi immediately outside the arrival terminal door. There is a constant stream of taxis so there is no need to book or wait. We have been hearing many reports of taxi drivers at Malaga airport over-charging people ! Before you get in a taxi, ask the fare to your destination and agree on this price. We have heard of people being charged up to 60 Euros to Fuengirola when the fare should be around 30-40 Euros. If you are not happy with the figure the driver gives you, simply go to the next taxi in the queue and ask him for a price - watch the price come down ! If you arrive at your destination and the driver asks for an extortionate fee, simply advise him that you are going to call the police.